Email marketing, the first tactic to arrive on the digital marketing scene, has experienced PR problems in recent years. Maybe it all started in the wake of the CAN-SPAM act of 2003, and the category never really recovered. But savvy professionals know otherwise: when email marketing best practices are followed, the tactic can serve as the cornerstone of a successful marketing operation. When thinking about your organization’s email marketing strategy and planning for improved performance, here are the considerations to keep front-and-center. This statement applies to both individuals and corporations. According to Pew, almost 9-of-10 of smartphone users actively check email on their phones. So the audience is there and engaged. Also, after being around for more than two decades, most organizations have some kind of email marketing strategy in place. In a recent survey by Smart Insights and Get Response (see exhibit), more than half of marketers said email marketing performed ‘good’ or ‘excellent’, outperforming all other tactics. 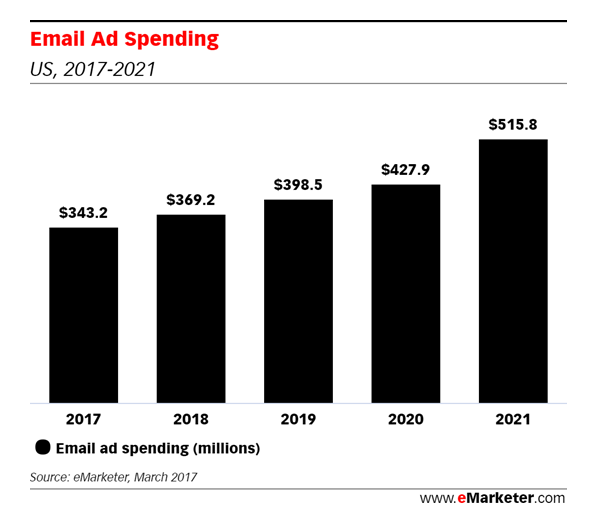 And, eMarketer forecasts the U.S. email advertising market to expand from $343M this year to $500M+ in 2021 – not the aggressive growth we see in other digital categories, but also not bad considering it’s been around awhile. If you don’t have a formal email marketing strategy in place, prioritize its design and launch as soon as possible. It’s likely that an in-house list exists somewhere, can be dusted off and put to use. If an email marketing plan is in place, have a senior member of the marketing team assess its status and budget. Depending on the type of organization, an email marketing strategy budget should account for 2.5% – 25% of overall marketing spending. For example, a large B2B company will skew smaller while a small B2C company will skew larger. Too many organizations measure email marketing performance on the easily available ‘rates’ made available by the email platform companies: open rates, click-through rates, deliver-ability rates, etc. While meaningful in some ways, they aren’t very useful in the context of strategic marketing goals like branding, engagement, and conversions. Deep-pocketed technology companies with sophisticated marketing and sales operations like Constant Contact, Hubspot, Marketo, and Salesforce have force-fed the industry a set of metrics which, outside of small and specialized email teams, aren’t very useful. Senior marketing managers and non-marketing executives don’t need to understand the minutia of the operations, and sharing ground-level performance data with them only weakens the impact. Email marketing performance is best viewed vis-a-vis other marketing tactics (direct mail, events, telemarketing, etc.) and its ability to contribute to customer acquisition and retention. While the true, absolute contributions of a tactic like email can often require sophisticated modeling and measurement operations – rolling up to attribution – the baseline metrics that are easy to track and serve as a reasonable proxy for attribution are conversions, engagement and sharing. These are genuine measurements of the impact of an email’s content and strategies. Successful email marketing operations follow a 3-to-1 give-versus-ask ratio. That is to say, companies employing email marketing best practices only ask for something – a purchase, a piece of information – one time for every three times they give. While people have an overall preference to email-based communications from brands, their biggest point of feedback, according to an Adobe survey, is to make the correspondence “less about promotion and more about providing me information”. This is a big challenge for brands of all stripes, as pounding email lists to meet quarterly or year-end goals is a common tactic — but a short-sighted and corrosive one. While challenging, employing the 3:1 ratio isn’t as difficult as it might seem. A “give” to a user base could be a coupon, an entertaining but brand-promoting video, or a white paper or webinar pass. It takes some planning and creativity, but most organizations have enough assets in place to make this happen without extraordinary effort. The important thing is to approach an email marketing strategy from a user-based perspective, and get the audience to look forward to opening your emails. It’ll pay major dividends over the long run. To be sure, an effective email marketing strategy can deliver on nearly every goal in a marketer’s crosshairs: branding, awareness, thought leadership, engagement, acquisition, and retention. So, from a strategic perspective, it’s not a question of “if”, but rather “how much”? That email marketing is the oldest and least shiny object among the current digital marketing tool set – which includes search, display, social, content, native, video, etc. – means that it might require an extra dose of support during budgeting season. But for most organizations, it’s well-worth the effort. Tim Bourgeois is a director at East Coast Catalyst, a digital strategy consulting company specializing in strategic roadmaps, digital marketing audits, ad fraud detection and management, and online marketing optimization programs. This article was originally posted on InContext, which is published by Digital Content Next—the only trade organization dedicated to serving the unique and diverse needs of high-quality digital content companies that manage trusted, direct relationships with consumers and marketers. Follow Digital Content Next (DCN)@DCNorgor subscribe to their email newsletter.